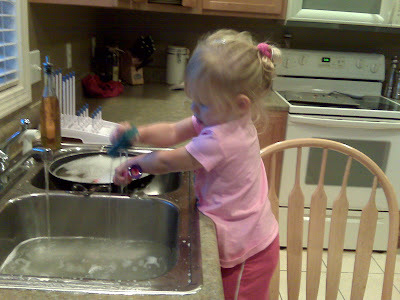 Addi loves to “help” with dishes, so this was not a huge shock. Her "helping" means she rinses the clean dishes, fills the bowls and cups with water, and makes a pile of water-filled dishes next to the sink. Not the most efficient way of cleaning up but hey, it’s 10 more minutes I don’t have to worry about her using Sam as her “baby doll” and trying to shove plastic fake food in her mouth. I quizzed her and she recounted how she bit Mason after he pushed her down. Last week Mason bit HER after a tussle over a plastic tub of toys, so this story sounded strikingly familiar. I called Kim and she said that yes, in fact Addi had claimed to have bitten Mason, but Mason said she didn’t. Apparently they did fight over the same plastic tub and my brute of a daughter threw him out of it and made him cry. Either way, Addi got to sit in time out. Now I need to decide if I should be more worried that I have a biter on my hands or a compulsive liar. Either way, preschool will be a blast.